Pressure mounted on Julen Lopetegui on Sunday as Real Madrid suffered a 5-1 defeat. Luis Suarez celebrates the second goal on Sunday. LUIS SUAREZ SCORED a hat-trick as Julen Lopetegui’s dismal Real Madrid reign appeared to near its end in a 5-1 Clasico humiliation at the hands of Barcelona. 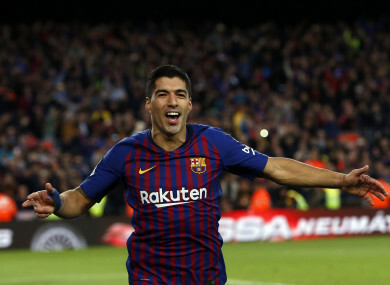 The irrepressible Suarez led Barca, who were rampant even without Lionel Messi and capitalised on their rivals’ failings to move back to the top of La Liga. Email “Luis Suarez scores hat-trick as Barcelona humiliate Real Madrid in electric El Clasico”. Feedback on “Luis Suarez scores hat-trick as Barcelona humiliate Real Madrid in electric El Clasico”.